My first encounter with foxes goes back to my very early years, visiting some friends of my father at their house in a small village somewhere down in the south-west of England. Who they were, or where the village was is lost to memory, and neither of my parents recall the incident, although I have very strong visual images of the house (red brick in a garden swathed in bushes), a walk up the hill behind the house (long grass, lightly treed), and the ‘nest’ with the cubs. They were beautiful (as in the cubs, although I’m sure the friends were, too) and I fell in love, and to this day I cannot help but be beguiled by the beauty of the red fox, and how clever and agile they are, and every time I see one dead by the side of the road a deep sadness fills me, just the same as if I see a ‘roo or a wombat that has been hit by a car. Don’t get me wrong. I understand that foxes are a nuisance. I understand that they don’t belong in Australia. And please understand me, I don’t keep chooks for the sole reason that I don’t want to limit them to a small, fox-proof enclosure. Because, around here, there are foxes. It is quite possible that we don’t have a rabbit problem (touch wood) because of them. Not that we see them very often, but there are signs that they are around. And a neighbour who keeps goats goes into overdrive when his breeding stock are kidding (just had to use that word) because of the trouble he has had in the past with the newborns apparently being taken by foxes. In our early days here, too, we found an old rusty trap with a dead fox caught in it, much to my concern as I truly don’t approve of trapping, and I certainly didn’t want to find any more through the unpleasant expedient of stepping on one. I know the neighbour has resorted to using poison baits, and I know he does it responsibly, with all the correct permits and so forth, and he always puts warnings in mail boxes. I used to worry about eagles scavenging on carcasses and getting poisoned, too, but I’m less concerned now since nothing much seems to scavenge on the foxes by the side of the road. Like wombats they seem to be there forever, slowly decomposing. I know of someone else who tried humane traps, but the foxes were too smart, and he ended up waiting them out and shooting them, but that took a fair bit of patience and guile, too. My reaction, though, when I glanced up while filling the kettle early the other morning to look right into the eyes of an old fella poking around the garden? 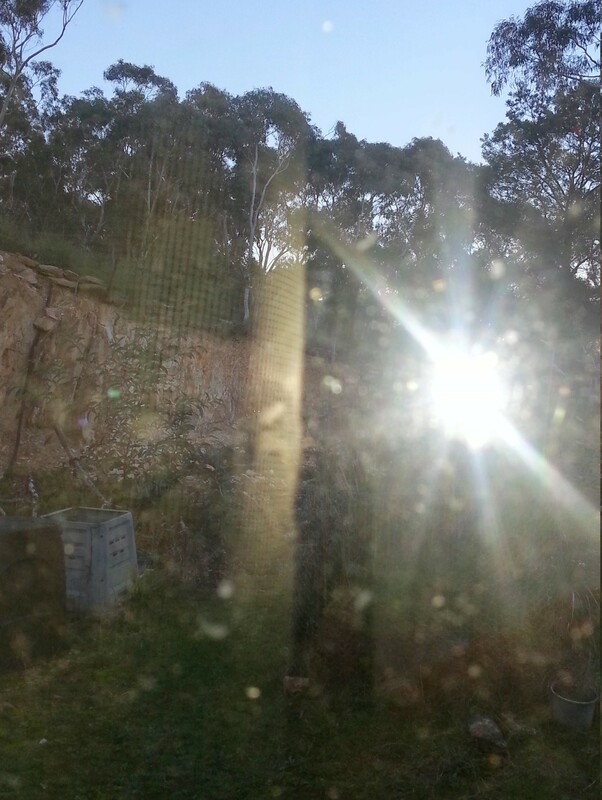 Sadly, I couldn’t find the actual camera in time, so my phone captured a weirdly blurred image of something questionably a fox, mostly hidden by the reflection of the flash in the window. Artistic perhaps, but unconvincing. By then he had wandered down to the compost bins, and my guess is he was hoping to find some rats or mice or something. He was quite big, with a roan coat, mottled ginger and white, and a dark red brush, mostly white legs, and dark, intelligent eyes. He had seen me at the same time as I saw him, but, initially at least, didn’t react. It wasn’t until the phone’s flash went off that he showed any concern. He didn’t wait around to find out if I had anything more in my arsenal than a flashing light, but disappeared up the cliff-face, as in directly up the cliff face (I mentioned their agility, didn’t I? ), and off into the bush. I’m not keen for him to come back, by any means, especially as I am weighing the pros and cons of getting myself a small herd of goats to help with weed clearing, but just seeing him reminded me of what amazing and beautiful creatures they are. And clever. I read once that it was possibly because they are so clever that people have an issue with them. We don’t like to be outsmarted! Red foxes were introduced (on purpose) to Australia for sport hunting way back in the 1800s, and from there have spread right across the continent (except the far north) and are now pretty much prevalent in every state except for Tasmania, where, a couple of years ago, there was a massive hunt after one was spotted leaving a ship (Fantastic Mr Fox on holiday?). I don’t know whether that one was ever found, but wildlife authorities have now confirmed evidence of possible habitation and there is a huge program to try and prevent it getting out of hand. Originally, competition with tassie devils was thought to be the reason that they hadn’t naturalised there before, but the poor old devil is having its own issues at the moment. 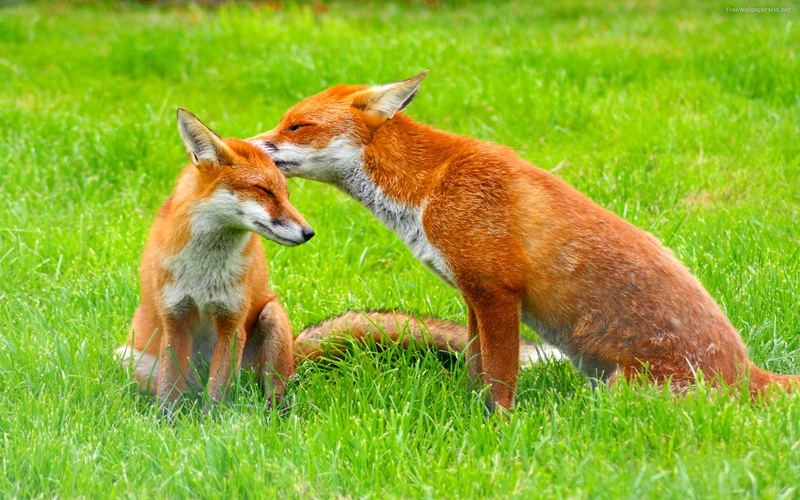 Apart from being a nuisance to farmers and backyard hen-keepers, of course, foxes are a problem for small, native animals, which have not evolved to be wary of them. Their distribution can be seen to correlate with the decline of native species such as bettongs, bilbies, numbats, small wallabies, and quokkas. While baiting and shooting remain the most widespread choice for management, research is being conducted on the reintroduction of native predators. Apparently, where dingoes have been reintroduced not only does the fox population decline, but native animal numbers start to recover. Its all about balance. sniffs me in the wind at her shoulder. or a raw heart, she’d smell it. She didn’t get this smart for nothing. or that’s our fond belief. because their parents were starving. This entry was posted in rural / bush living, wildlife and tagged balance, feral animals, fox, wildlife on May 13, 2015 by seventysevenacres.